Jubal half walks, half skips to a large, open room at the front of HOPE Christian School: Via, which opened its doors a little more than a year ago as one of the newest schools in the HOPE Christian network. “This is where we eat lunch,” the Kindergartener proclaims. “I don’t need a sign anymore. I know this is my spot for lunch … and, this is Theodore’s,” he adds, zooming to the next set of tables; “And, this is Allistair’s … and, this is Charlotte’s.” He stands for a millisecond to catch his breath, and flashes a gleaming smile to his siblings, who are watching. Then, he quickly scoots under his mother, Moriah’s, arm. Of her four children attending the school, Jubal is the “rambunctious” one, Moriah Davis says, smiling. Moriah and her husband, Ethan, a pastor at Racine’s Calvary Memorial Church, had been searching for a school for a while. For the last few years, the couple has home-schooled their children, in part because their oldest son, Corban, has Down Syndrome, and to teach him at home was the most comfortable route. In September, however, they added the sixth child to their young family, Evangeline, who also has Down Syndrome. Teaching everyone at home became a bit unmanageable, says Moriah. A year ago, a flyer in the mail caught Moriah’s attention. HOPE had invited them to consider the new Racine school and to apply for the Racine Parental Choice Program. It seemed interesting, but the Davises just didn’t know enough about the School Choice, or voucher, program, that allows students to attend private schools tuition-free if their income qualifies. 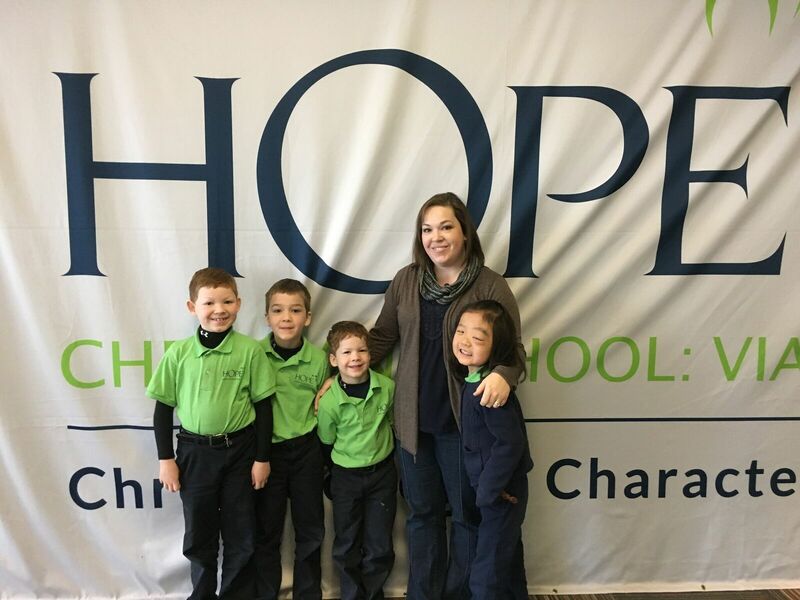 Primarily, because HOPE Christian School: Via is a Christian school, the Davises looked more closely at it as a possibility for their children. Aside from the religious aspects, Moriah says the school’s high academic standards and expectations for behaviors, were also selling points. When they visited the school, the staff took time to make them welcome and explain their philosophy. “It was the same kind of education we had been giving them at home,” she says. Theodore, a third-grader who always seems to have his nose in a book, according to his mom, has improved his reading skills. “When we were teaching at home, the boys seemed to be really excelling, and Theodore is still being pushed here,” says his mom. Moriah knew her boys would quickly adapt to the new school, but she wasn’t sure about Charlotte, who was adopted from China two years ago and who copes with the ramifications of an illness called: “neurofibromatosis,” which causes tumors to grow on nerves throughout her body. Charlotte has a tumor growing on the nerves that wrap around one of her eyes. Despite surgery in May, the tumor is back. She also has tumors on each optic nerve. Moriah says specialists are watching the situation, but it’s unknown how much these tumors impede her eyesight now, or will even more so in the future. For Moriah, who grew up in Racine and graduated from Washington Park High School, she had not imagined what it would mean to pick out a school for her own children. In the end, she is confident she and her husband made a good choice, one that would not have been possible without the voucher program. “We’ve been really happy. HOPE has been a good thing for our family.